In many ways, 2017 ushers in a new era for US-Japan-Korea relations. The whirlwind election of 2016 for the United States and the recent impeachment of South Korean President Park Geun-hye put all three countries in a position where cooperation has rarely been more important. For this new paradigm, new ideas are needed from new places. Far from being inexperienced, today’s young generation is perhaps better prepared than any to carry the torch of US-Asia relations and policy. Thanks to cultural and academic exchange programs, the Internet, and immigration trends, young leaders of today are more knowledgeable about world affairs than ever. 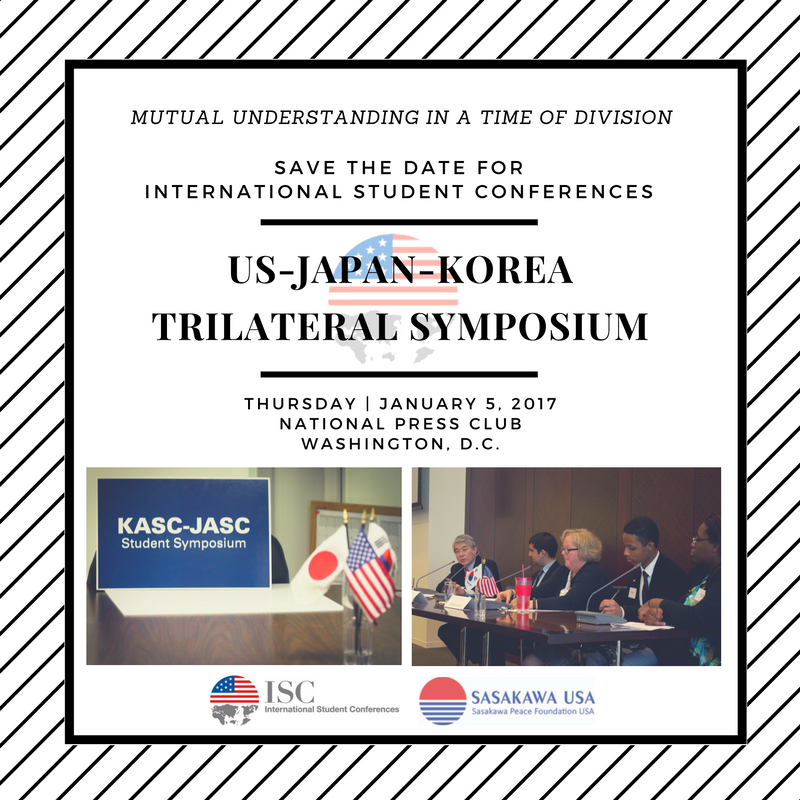 On January 5, 2017 Sasakawa Peace Foundation USA (Sasakawa USA) partnered with International Student Conferences (ISC) and the Korea Foundation to provide the voice of future leaders for U.S.-Japan-Korea cooperation. Student leaders came together with senior experts to discuss important, topical issues affecting the three countries. The fourth annual Symposium demonstrated the ability of the younger generation to engage in a productive dialogue on U.S.-Japan-Korea relations, including ideas for improving trilateral cooperation. In the week leading up to the symposium, ISC brought together Japanese, American, and Korean university students for a joint program between Japan-America Student Conference (JASC) and Korea-America Student Conference (KASC) in Washington, D.C. The program facilitates discussion on different perspectives of historic events and provides a forum to explore opportunities to move forward with future trilateral cooperation. Sasakawa USA is proud to have sponsored the eight Japanese students who attended the conference, as well as to co-sponsor the symposium. Click here for a summary of the event, or here for more information on Sasakawa USA’s partnership with International Student Conferences.